Epsom salts are magnesium sulfate. According to the Epsom Salt Council, they are used in bathing to soften skin and soothe sore muscles; internally as a purgative; and in the garden to help seeds germinate and produce more flowers. You cannot simply replace sea salt or table salt with Epsom salts, as they are made up of entirely different minerals. A good substitute for Epsom salts may be Dead Sea salt. Table salt is 99.9 percent sodium chloride, and sea salt is 98 percent sodium chloride. 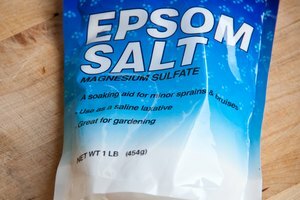 Epsom salt is 100 percent magnesium sulfate. Dead Sea salts are made up of mainly chloride, magnesium, sodium calcium, potassium and bromide. Because both magnesium and bromide have soothing effects on the body, for bathing purposes Dead Sea salt may be a good substitute for Epsom salts. They both work to ease sore muscles and relax the nerves. They also both work well for skin softening and improving the circulation, according to the Epsom Salt Council and the Dead Sea Research Center. To make a bath scrub, you can substitute sea salt, Epsom salts or Dead Sea salt. The exfoliating action of any of these salts would work in a similar way. In fact, for exfoliation, you also may substitute coffee grounds or sugar. Any of these substances will have a similar effect on scrubbing away the dead surface skin on your body. The magnesium in Epsom salts may help to soften skin and does not need to be rinsed off, however. Other scrubs will have different effects. Dead Sea salt also will work to soften skin, whereas sea salt can be drying. Sugar is a milder alternative to salt and works well for older or sensitive skin. Coffee is a gentle exfoliation alternative as well, and some evidence suggests that it may help smooth cellulite-ridden skin. To substitute Epsom salts as a purgative, you may want to try another purgative salt such as sodium sulfate or potassium sodium tartrate. According to the American Heritage Medical Dictionary, the term “salts” can mean any number of saline cathartics. Epsom salts is just one of many types of salt used for this purpose. According to the University of British Columbia Botanical Garden website, using Epsom salts in gardens to improve soil may be a good idea if your soil is alkaline and if it needs magnesium. Instead of thinking of a substitute for Epsom salts in the garden, it is better to simply decide exactly what your soil needs and add that substance. This may change with the seasons and also change as soil conditions change. Calcium sulfate may be a good substitute for Epsom salts in some areas. In other areas, you may need to do little to improve the soil. Consult a local gardening supply store for more specific information on your garden’s needs.